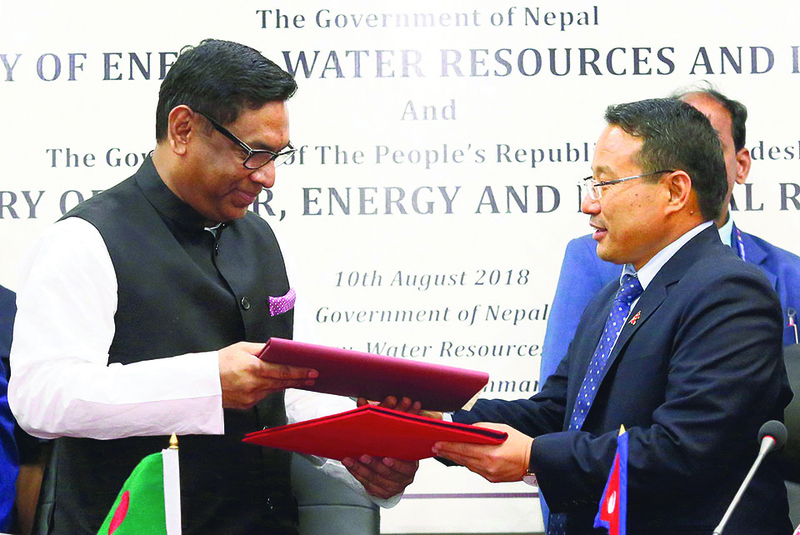 On August 10, Nepal and Bangladesh signed much-awaited memorandum of understanding (MoU) paving the way for energy cooperation between the two countries. Both countries had realized a huge potential in energy cooperation that needs to be tapped but it was delayed owing to various internal reasons of both the countries. Now they can hugely benefit from this cooperation if further steps are accomplished without any further ado. To put it simply, Nepal can export electricity to energy hungry Bangladesh. Bangladesh is a fast-growing economy with Gross Domestic Product (GDP) growth rate between six and seven percent. And it cannot manage its increasing power requirement internally, which is why it is relying heavily on natural gas. To sustain or even expand its current economic growth, Bangladesh plans to import power from India, Nepal, Bhutan and Myanmar to meet its rising demands. There are projections that Bangladesh’s power demand will double by 2030. In the recent years, the import of power from India to Bangladesh has almost doubled. It is obvious that Indian power transmission lines should be used to transmit electricity for which India’s constructive and supportive role is crucial to turn the dream of energy cooperation between Nepal and Bangladesh into reality. Bangladesh is asking India to facilitate the cross-border power sector cooperation with Nepal. As both Nepal and Bangladesh have good ties with India, this issue can be sorted out if some efforts are made. During her India visit in April, 2017, Prime Minister of Bangladesh Sheikh Hasina had requested Indian Prime Minister Narendra Modi for facilitation of the cross-border power sector cooperation with Nepal. The Indian side, however, did not give any concrete response on the issue. India prefers to buy electricity from Nepal and export to other countries, including Bangladesh. In this context, both Nepal and Bangladesh should hold serious negotiations with India. Bangladesh, from both government and private sector, has expressed desire to invest in some hydropower projects under Bhutan, Bangladesh, India, Nepal (BBIN) framework. Under Bangladesh-India-Nepal (BIN) framework, Bangladesh plans to import Nepal’s electricity through BBIN corridor. As two sides held some discussions on some specific hydropower projects, the signing of MOU is likely to create an appropriate environment. And Bangladesh wants to invest in Sunkoshi-2 and Sunkoshi-3 hydropower projects. Under BIN, there are other areas such as water resources management, mitigating the effects of climate change, trade, and transit among others. In recent years, along with energy cooperation, substantial progress has been made in some other vital areas, but there still are some unexplored areas for cooperation. Connectivity is one major area that has made some progress lately, but a lot needs to be done on this. Trilateral cooperation between Nepal, Bangladesh and India can be established for connectivity. The direct bus service, air connectivity, railway connectivity and waterways are the major areas where Nepal and Bangladesh can work together. This will be beneficial for both the countries. There is already air-service agreement between two countries. A trial bus service on Nepal-India-Bangladesh route was flagged off in April this year. Now, the three countries should take up serious discussion for a regular bus service between three countries under BIN sub-regional framework. It is high time Nepal and Bangladesh seriously thought about railway connectivity. The Executive Committee of National Economic Council of Bangladesh in May this year decided to build 217-kilometre double rail line from Khulna to Darshana with a purpose of boosting trade between Nepal and Bhutan using Mongla port. So, trilateral railway connectivity should be the priority of all three countries. Bangladesh is also eagerly waiting for railway link between Nepal and China. Experts in Bangladesh are of the view that if there is railway link between China and India, it will be easy for Bangladesh to send its products to China. Tourism is another vibrant area of cooperation. The number of Bangladeshi tourists in Nepal is increasing in the recent years. According to Ministry of Foreign Affairs, 17,563 Bangladeshi tourists visited Nepal in 2011 which reached 23,440 in 2014 and the number is increasing. There are tourism packages namely ‘from highest peak to the longest breach’ and ‘Buddhist circuit’. Recently, Lumbini Development Trust provided a plot of land to Bangladesh for the construction of a Buddhist Monastery in Lumbini. There is scope of Foreign Direct Investment from Bangladesh. We are seeking more and more investment from India and China, but paying less attention to the other countries. In recent years, many businessmen in Bangladesh are exploring the potential areas of investment in Nepal. Both countries are also doing homework for signing the Bilateral Investment Protection and Promotion Agreement (BIPPA). It should be concluded without any delay. Cooperation on trade and commerce can boost the economic development of the both countries. There is still a huge scope for expanding and diversifying trade and commerce between two countries. According to Ministry of Foreign Affairs, Nepal’s exports to Bangladesh constitute mainly yellow lentils, oil cakes, cardamom (large), wheat, vegetable seeds, handicrafts, pashminas etc. Imports from Bangladesh include industrial raw materials, chemicals, fabrics and textile materials, jute products, electric and electronic items. Nepal is seeking duty-free market access to 108 products in Bangladesh and preferential market access to 50 Bangladeshi products in Nepali market. The Commerce Secretary-level meeting between the two countries has been taking place though without substantial progress. We are suffering from a trade deficit with Bangladesh. We should bridge the gap immediately. According to the data provided by Nepal Transit and Warehousing Company Limited, Nepal imported goods worth Rs 3.53 billion while export was only 1.91 billion. Bilateral trade took off after Kankadbhitta-Phulbari-Banglabandh transit route came into operation in August 1997. The trade imbalance was widened mainly in the last decade as Nepal’s export to Bangladesh shrunk due to various reasons. Recently, Bangladesh adopted the policy to discourage imports and promote domestic products. Along with bilateral engagement, Nepal and Bangladesh share some regional platforms such as SAARC, BIMSTEC and BIN. As both countries share similar views on many regional issues, there is a scope for collaboration. Similarly, Nepal and Bangladesh can cooperate in United Nations and Non-aligned Movement (NAM) and other international platforms. As there is a lot of scope of cooperation, frequent high-level visits between the two countries could enhance the bilateral cooperation even more. It’s time for both Nepal and Bangladesh to chart a clear course of bilateral relation that reflects the changing regional dynamics.